Visit Invitations by Dawn online at InvitationsByDawn.com for an impressive selection of wedding invitations produced with the highest quality printing in the industry. Invitations by Dawn carries a large selection of theme invitations and accessories for every popular wedding style. Invitations By Dawn features Destination Romance, Seasons of Love, Wedding Country, Naturally Ever After and Modern Distinctions catalogs, with specialty invitation and accessory lines for destination, seasonal, Western, eco-conscious and modern celebrations. Save on your next purchase from InvitationsByDawn.com with discounts, coupons, promotions and savings from 58coupons.com. Enjoy free shipping from InvitationsByDawn.com on purchases of $175 or more. Click link to start shopping. 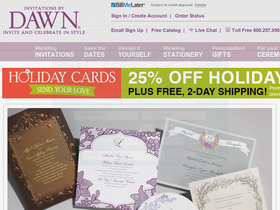 Be sure to check out the online exclusives to save 10% from Invitations By Dawn. Click link to save. Hurry on over to InvitationsByDawn.com to save up to $30 or more on invitations. Click link to start saving. Invitations By Dawn has garters in 6 different colors for only $7.95. Click link to view. Check out the free samples to enjoy the quality of these beautiful invitations from Invitations By Dawn. Check out Invitations By Dawn where you'll find many different invitations for under $100. Click link to view.